Ferrari which deals in manufacturing luxurious sports cars has attained a 10.2 percent sales growth in 2018 as compared to the previous year. 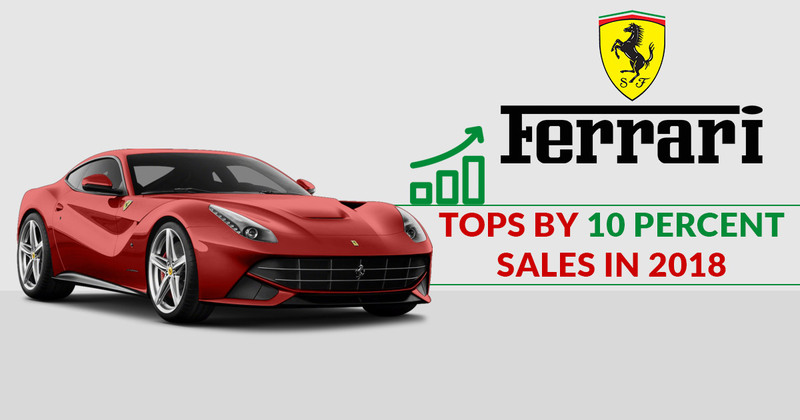 The company sold a total of 9,251 units of Ferrari in the year 2018 throughout the globe. In 2018, the company has sold 853 units more than that of the total sales in 2017. Sales reports indicate that the major sales contribution from the V12 models of Ferrari. Ferrari 812 superfast and La Ferrari Aperta have been liked by most of the customers. The Ferrari Portofino and 488 Pista collectively contributed a 19.6 percent growth in sales whereas the V8 models have achieved a growth of 7.3 percent. Now moving to the region wise sales, Ferrari has witnessed a 13.1 and 6.7 percent sales growth in America and Europe respectively. However, the company has contributed a sales growth of 12.6 percent combinedly from China, Hong Kong and Taiwan. Sales growth enhanced by 7.8 percent in other Asian countries. While the net revenue has hiked to Euro 3.42 billion, calculated to be 0.1 per cent surge in the current currency exchange rate while 3.2 per cent if seen through a constant rate.